Play On: North Carolina Tar Heels -3. I’m recommending a play on North Carolina minus the points on Friday. Neither defense performed well throughout the regular season, but UNC owns the better and more consistent offense and they have a new wrinkle on defense (I’ll get to it in a minute). I certainly feel the Scarlet Knights’ defense is going to have a very tough time containing the Tar Heels’ offense. 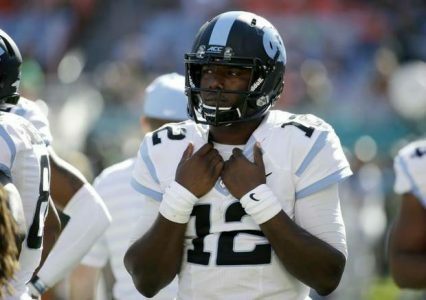 UNC QB Marquise Williams is an absolute handful, throwing for 2,870 yards and running for 737 yards. Williams ran for 12 TDs and accounted for 32 TDs on the season, overall. Williams owns a strong stable of receivers who’ll give the Rutgers’ secondary matchup issues. Back to the UNC defense. The Heels fired their defensive coordinator after the regular season. Dan Disch takes over the defensive reigns and promises to be much more aggressive. This is not good news for a Rutgers offense led by a drop-back passer with little mobility. I expect QB Gary Nova to be under some heat and when he has been forced out of his comfort zone and has to hurry, he has made a ton of mistakes during his career at Rutgers. So, we have an edge on offense to North Carolina and a new wrinkle on defense to push the Heels over the top. We’ll back the ACC entry and recommend laying the points with North Carolina in Friday’s Quick Lane Bowl. Thanks & GL! Scott Spreitzer. Scott Spreitzer CASHED his first of three CFB Bowl MAIN EVENT releases on Christmas Eve. He’s back on Friday with his next CFB FRIDAY BOWL KNOCKOUT! Scott’s side is in a strong, yet under-valued spot and he’s ready to make the books pay!